Summary: Acute embolic occlusion of the intracranial internal carotid bifurcation is associated with a poor prognosis. Recanalization rates of this lesion with intravenous or intraarterial thrombolysis are exceedingly low. We describe the use of balloon angioplasty after failed thrombolysis to achieve immediate recanalization of acute carotid T occlusions in two patients. At 1-month follow-up, both patients were alive with neurologic deficits. For acute carotid T occlusion, balloon angioplasty should be considered a first-line endovascular therapy. Acute occlusion of the distal intracranial segment of the internal carotid artery (ICA) typically causes sudden and severe hemispheric ischemia. This type of occlusion can extend from the supraclinoid portion of the ICA to the proximal segments of the anterior and middle cerebral arteries (MCAs) (carotid T occlusion [CTO]) as well as occlude the origins of the anterior choroidal artery and lenticulostriates. Studies have shown that an acute occlusion of the terminal part of the ICA has a poor prognosis; this lesion commonly leads to death, with morbidity and mortality rates substantially higher than those of acute MCA occlusions (1–3). Furthermore, to our knowledge, none have reported spontaneous early recanalization of an occlusion at the ICA bifurcation. Recent findings have shown that successful thrombolytic recanalization of vascular occlusions in the anterior cerebral circulation is associated with improved clinical outcome (4). Despite the increased use of intravenous and intraarterial thrombolysis, the rate of recanalization in CTO remains low (3), and some have pursued emergent microsurgical embolectomy to treat acute CTO, with limited success (5). Given the poor prognosis of CTO and the relative ineffectiveness of current therapies, safer, faster, and more effective recanalization techniques are needed. Intracranial balloon angioplasty has the advantages of current availability, a well-known technique (including the interventionalists’ familiarity with its use in the treatment of other intracranial diseases such as vasospasm due to subarachnoid hemorrhage and intracranial atherosclerotic stenosis), and timeliness (it offers faster recanalization than chemical thrombolysis). However, intracranial balloon angioplasty, particularly beyond the M1 segment of the MCA, is perceived to be a riskier endovascular technique; it is a second-line option, if it is considered at all, in the treatment of acute stroke. The use of intracranial balloon angioplasty to augment intraarterial thrombolysis of proximal MCA occlusions has been reported (6, 7). However, published reports of intracranial balloon angioplasty in CTOs are scant and have been limited by incomplete clinical descriptions, partial or failure of the recanalization, and poor clinical outcomes. We report two cases of acute occlusion of the dominant-hemisphere terminal ICA. The lesions were immediately recanalized with balloon angioplasty after intravenous and intraarterial thrombolysis failed. The cases had relatively good clinical outcomes. A 57-year-old woman with diabetes mellitus, end-stage renal disease (she was undergoing hemodialysis), and coronary artery disease (with prior myocardial infarction and coronary artery bypass surgery), presented with sudden-onset right-sided weakness and speech difficulty. At physical examination, she had a leftward gaze preference, a right visual field defect, right hemiparesis, and right sensory deficits. Her National Institutes of Health Stroke Scale (NIHSS) score was 13. Head CT showed no developing hypoattenuation or hemorrhage, but it did reveal a hyperattenuating left supraclinoid ICA. Transcranial Doppler (TCD) sonography was performed and showed an occlusion in the left supraclinoid ICA and no collateral flow. At 2 hours 50 minutes, intravenous tissue plasminogen activator (t-PA) was infused per the National Institute of Neurological Disorders and Stroke (NINDS) protocol (4). Repeat TCD sonography performed within an hour showed no evidence of recanalization. Cerebral angiography performed at 4 hours confirmed terminal left ICA occlusion (Fig 1A). With the aid of a soft microguidewire, a microcatheter was used to traverse the clot, and an intraarterial infusion with reteplase (Retavase; Centocor, Malvern, PA) was initiated. After 3 U of reteplase was infused beyond and within clot, control angiography was performed; this showed minimal improvement (Fig 1B). At 5 hours 45 minutes, with the aid of an exchange 0.014-inch microguidewire, a low-profile high-pressure balloon microcatheter (Stealth Dilation System/120502, 2.5-mm diameter, 15-mm length; Target Therapeutics/Boston Scientific, Watertown, MA) was advanced through the clots into the supraclinoid ICA and M1 segment of the MCA. After the occlusive valve wire was placed under direct fluoroscopic monitoring, a 1-mL contrast-agent syringe was gently inflated by hand for approximately 5 seconds at a time. Three inflations were performed. Control angiography then showed complete recanalization of the occluded supraclinoid ICA and proximal M1 segment of the left MCA (Fig 1C and D). The patient was then transferred to the intensive care unit. No immediate clinical improvement or deterioration was noted. TCD sonography performed the following day confirmed continued complete recanalization of the supraclinoid ICA and left MCA. At 24 hours after treatment, MR imaging revealed localized infarctions in the left basal ganglia and parietal lobe. Echocardiography revealed a dilated left ventricle with a 25%ejection fraction, septal and apical akinesis with anterolateral hypokinesis, and biatrial enlargement. However, no thrombus was identified. One month after admission, the patient was discharged. She had good mobility in bed, she was able to independently transfer herself to a chair, and she could feed and dress herself without assistance. The patient had a modified Rankin score (mRS) of 4. A, Left ICA angiogram, frontal projection, obtained after the intravenous t-PA infusion confirms the persistent supraclinoid ICA occlusion. B, Left ICA angiogram, frontal projection, obtained after intravenous and intraarterial thrombolysis shows minimal improvement with a continued supraclinoid left ICA and left M1 segment MCA clot burden. Note the course of the microcatheter through the clot. C and D, Control left ICA angiograms, frontal (C) and lateral (D) projections, obtained after balloon angioplasty of the left supraclinoid ICA and left M1 segment MCA show complete recanalization of the carotid T.
A 73-year-old man presented with hypertension and sudden right-sided weakness and speech impairment. At physical examination, he could not follow simple commands, responding only to painful stimuli. He had leftward gaze deviation, a right visual field defect, right facial weakness, and a right hemiparesis and hemisensory deficit. His NIHSS score was 17. Head CT showed no developing hypoattenuation or hemorrhage, but it did reveal a hyperattenuating left MCA sign. TCD sonography was performed and showed a left carotid T occlusion. At 2 hours 48 minutes, the patient was treated with intravenous t-PA infused according to the NINDS protocol (4). Repeat TCD sonography performed within an hour showed no recanalization. 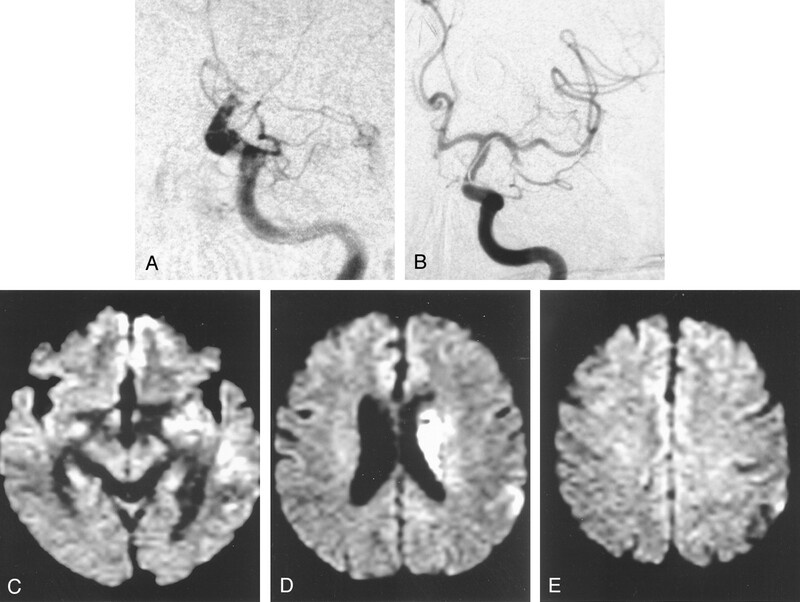 Cerebral angiography confirmed distal left ICA occlusion (Fig. 2A). Contralateral right ICA injection showed no cross-filling to the left anterior or MCAs. With the aid of a soft microguidewire, a microcatheter was used to traverse the clot, and an intraarterial infusion with reteplase was initiated at 4 hours 45 minutes. After 2.5 U of reteplase was infused beyond and within the clot, control angiography showed no notable improvement. At 6 hours, with the aid of an exchange 0.014-inch microguidewire, a low-profile high-pressure balloon microcatheter (Stealth Dilation System/120502, 2.5-mm diameter, 15-mm length; Target Therapeutics/Boston Scientific) was advanced through the clots into the supraclinoid ICA and M1 segment of the MCA. After the occlusive valve wire was placed under direct fluoroscopic monitoring, a 1-mL contrast-agent syringe was gently inflated by hand for approximately 5 seconds at a time. 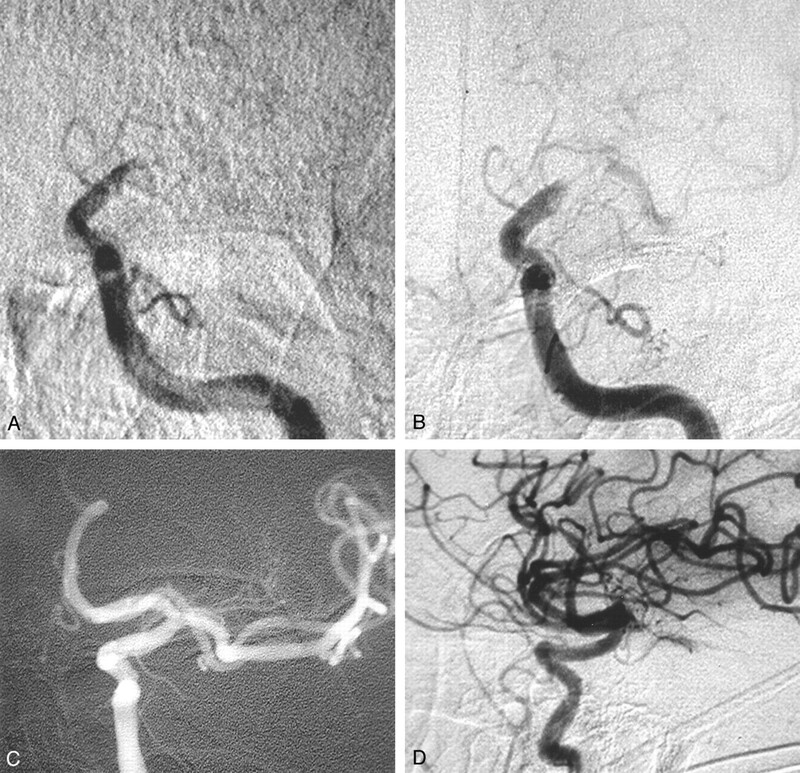 Control angiography then showed complete recanalization of the occluded supraclinoid ICA and proximal M1 segment of the left MCA (Fig 2B); however, the inferior M2 trunk remained occluded. Despite attempts to perform thrombolysis in the M2 segment with an additional unit of reteplase, this branch could not be recanalized. Postprocedural CT revealed infarction of the left basal ganglia; however, no clinical deterioration was observed. At 24 hours after treatment, diffusion-weighted MR imaging showed complete limited infarctions of the left basal ganglia and periventricular corona radiata, with relative sparing of the cortical territory (Fig 2C–E). Workup revealed paroxysmal atrial fibrillation. After 2 weeks of inpatient rehabilitation, the patient was discharged home with an mRS of 2. A, Left ICA angiogram, frontal projection, shows persistent left supraclinoid ICA occlusion despite the intravenous t-PA infusion. A contralateral right internal artery injection and TCD sonography confirmed the carotid T occlusion. B, After intravenous and intraarterial thrombolysis failed to recanalize the occlusion, balloon angioplasty was performed. Postangioplasty left ICA angiogram, frontal projection, shows recanalization of the left supraclinoid ICA and the M1 segment of the MCA. The inferior M2 trunk remains occluded. Despite further intraarterial thrombolysis in this M2 trunk, recanalization was not achieved. C–E, At 24 hours after treatment, diffusion-weighted MR images show increased signal intensity in the left basal ganglia and periventricular corona radiata but otherwise limited increased signal intensity in the MCA cortical territory. Our experience and that of others strongly suggest that intravenous and intraarterial thrombolysis is ineffective in achieving recanalization of symptomatic terminal ICA occlusions. The high failure rate of chemical thrombolysis in terminal ICA occlusions coupled with the high likelihood of severe morbidity or death in patients with persistent large vessel occlusion prompted us to seriously consider further mechanical manipulation with balloon angioplasty to establish good in-flow and to sustain recanalization in our patients. Of the locations within the intracranial anterior vascular territories compromised with acute occlusion (most commonly from thromboembolism), those in the intracranial ICA bifurcation have the worst prognosis regardless of the treatment technique (1–3, 8). For acute occlusions of the terminal ICA, intravenous thrombolysis has been largely ineffective, with recanalization rates approaching zero (9). For terminal ICA lesions treated with intraarterial thrombolysis, recanalization rates are better, but they are also disappointingly low (approximately 10–15%) (3). More importantly, the results of most series suggest that the prognosis for patients with CTO is poor, even if they are treated with intravenous or intraarterial thrombolysis. Jansen et al (3) reported a series of 32 CTO patients who were treated with intravenous or intraarterial thrombolysis in which 84%had poor prognosis; they had a 53%mortality rate. In the series of 19 patients with CTO who were examined by Kucinski et al (10), 47%died, compared with 15%of those with occlusions in other vascular territories. Indeed, the authors concluded that CTO, as determined with angiography, is a substantially better predictor of fatal outcome in patients undergoing intraarterial thrombolytic therapy than the extent of CT hypoattenuation. In the series by Zeumer et al (11), all eight of the patients with CTO who were treated died. More recently, in the five patients with CTO in the series by Jahan et al (8), intraarterial thrombolysis was technically successful in only one; herniation occurred in four of the patients, who subsequently died. Regarding emergent microsurgical embolectomy in CTO, Touho et al (5) described a series of six patients. Four CTOs were recanalized, and 67%of the patients had poor outcomes; the mortality rate was 33%. A large clot burden and clot composition as reflected by its organization, calcification, and platelet-fibrin content are thought to contribute to the low recanalization rate in CTOs after thrombolysis (3, 8). In the largest series to date, Jansen et al (3) suggest that the dismal prognosis of CTO is most associated with a poor leptomeningeal collateral circulation and brain edema,not necessarily recanalization. These authors found no association between good collateral circulation and the success of recanalization or between the recanalization rate and intracranial hemorrhage. However, despite the small number of their patients who survived, they suggested that the absence of recanalization was associated with a high mortality rate and that recanalization might be clinically beneficial in patients with good leptomeningeal collaterals and little or no hypoattenuation on pretreatment CT scans. Contrary to our experience and that of most others, the only series that showed relatively good outcomes with thrombolysis of CTOs was that of Ernst et al (12). In their series of five patients with CTO, four survived after effective recanalization with intravenous and intraarterial thrombolysis. In this series, despite the small number of patients, the shorter time to intraarterial thrombolysis (3.3 hours on average for those with CTO) was believed to contribute to the improved technical and clinical outcomes. On the basis of these observations and as the results in our two cases suggest, patients with CTO may have the most to gain from timely mechanical thrombolysis, and they may have the most to lose if treatment is terminated after thrombolysis fails. Intracranial ICA balloon angioplasty appeared to be safe (it was deemed safer than MCA M1-M2 balloon angioplasty given the larger caliber and proximity of the target vessel), technically straightforward, and less time-consuming and more effective than thrombolysis, with an immediate effect. Previous reports of CTO balloon angioplasty have been limited and were associated with questionable technical success and poor clinical outcomes. Qureshi et al (6) described their experience with intraarterial reteplase, a third-generation recombinant t-PA, in 16 patients; balloon angioplasty was used as additional therapy in seven patients. Of these 16 patients, three had CTO, and in two of these patients, balloon angioplasty was used in addition to thrombolysis. In one patient, recanalization could not be achieved (TIMI 1). In the other, recanalization was achieved, but an intracranial hemorrhage developed. Both patients died within 10 days. The clinical details of these two cases were not provided, nor were the details of their balloon angioplasty technique or its contribution (separate from that of thrombolysis) to the angiographic results. This team reported two additional cases in which CTO balloon angioplasty was performed after failed thrombolysis (7); however, in these two patients, complete recanalization (TIMI 1 and 2) could not be achieved, and the clinical outcomes of the patients were not provided. Limitations in the use of intracranial balloon angioplasty in patients with CTO include an increased procedural risk to the patient. Intracranial balloon angioplasty of the supraclinoid ICA and proximal M1 segment of the MCA can lead to arterial dissection or catastrophic vessel rupture, distal embolism, and occlusion of the anterior choroidal artery origin or lenticulostriates. In addition, long-term vascular injury may result from balloon angioplasty, because higher pressures are used to achieve mechanical thrombolysis. To minimize the risk of complications, we recommend undersizing the balloon with respect to the size of the vessel. For example, a 2.0- or 2.5-mm (maximum 3.0-mm) balloon microcatheter could be used in CTO lesions. In both of our cases, because the results of intravenous and intraarterial thrombolysis were negligible, an underlying stenosis of the supraclinoid ICA could not be completely excluded before angioplasty. However, given the lack of a waist during balloon angioplasty, an underlying stenosis was not suspected afterward. Whether intraarterial reteplase (rather than t-PA with more surface effect) penetration into the thrombus softens the clot for more effective balloon angioplasty is not known. Although the risks and benefits of intracranial balloon angioplasty in the treatment of ischemic stroke are yet to be determined in a larger series or clinical trial, the results in our two cases support the statement that balloon angioplasty is a technically feasible option in patients with acute CTO stroke in whom thrombolysis fails. We have shown that immediate recanalization of CTO can be achieved with intracranial balloon angioplasty and that this recanalization may be clinically beneficial in patients with this dangerous lesion. Given the grim prognosis of patients with CTO and the relatively long duration and high failure rate of chemical thrombolysis for lesions in this location, further investigation of intracranial balloon angioplasty as the primary therapy for earlier and more effective CTO recanalization is warranted. At our institution, the current (though individualized) endovascular treatment of patients with carotid T occlusions is a trial of low-dose (1 U) intraarterial reteplase administered over 10–15 minutes. If no response occurs, early balloon angioplasty is performed. The intraarterial infusion is rarely effective in achieving recanalization, but may soften the clot for mechanical disruption with balloon angioplasty, and it may aid in the delayed thrombolysis of a distal thromboembolism (although these effects are unproven). Patients in whom the lesion is diagnosed within 3 hours of ictus receive intravenous t-PA according to the NINDS protocol. If patients are treated after 3 hours of ictus and if they are not involved in research protocols to the contrary, intravenous t-PA is bypassed. This approach espouses the guiding principle that earlier recanalization is better, and it attempts to balance the goal of not using time-consuming yet more established treatments such as 2-hour intraarterial thrombolytic infusions (which have not been shown to be effective) with the risk and uncertainty of intracranial balloon angioplasty. Patients with acute CTO have a poor prognosis, and current treatments are ineffective. Although the intracranial balloon angioplasty is more experimental technique that involves mechanical disruption, it appears to be more effective in achieving timely recanalization in these difficult lesions. As we gain more experience, earlier balloon angioplasty without chemical thrombolytics may be the best treatment for CTO. Aggressive Mechanical Clot Disruption: A Safe Adjunct to Thrombolytic Therapy in Acute Stroke?